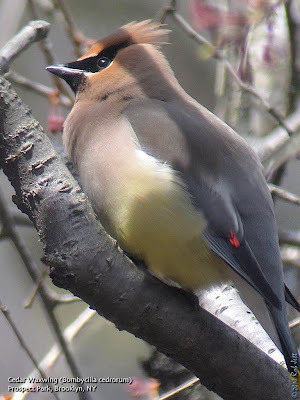 As relatively late breeders, flocks of Cedar Waxwings have just begun appearing in our city parks. Listen for their high-pitched, whistling call and look for them feeding within Black Cherry trees and other fruiting trees and shrubs. 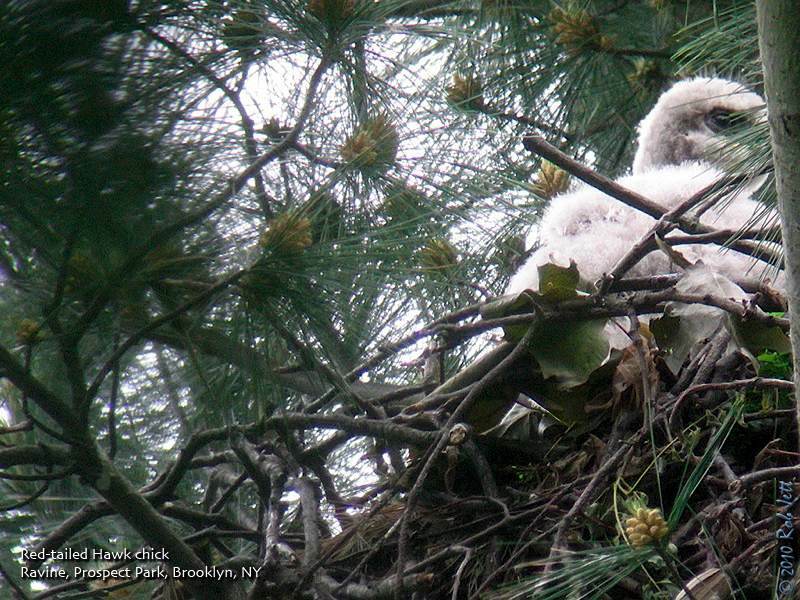 A quick run to the red-tailed nests in Prospect Park revealed a pleasant surprise. 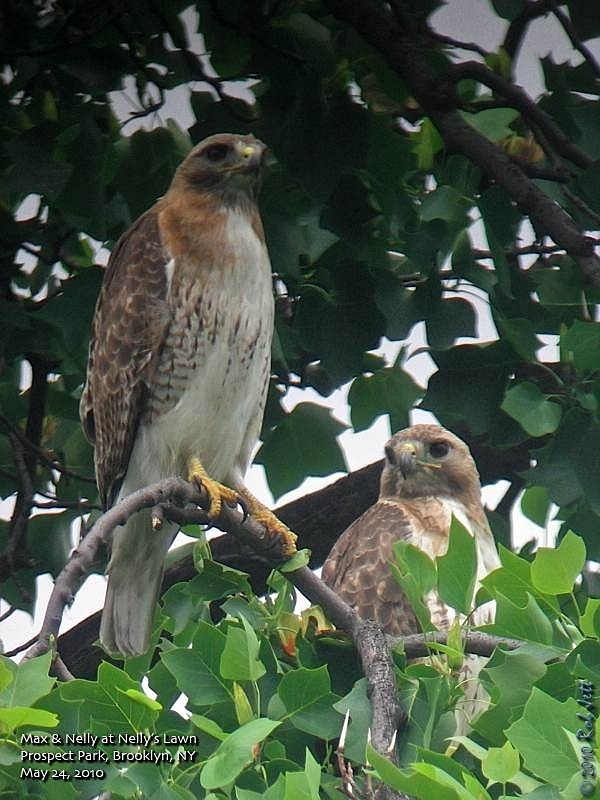 At Nelly's Lawn, Max & Nelly were keeping a close eye on their triplets from a favorite perch in Elizabeth's Tuliptree. 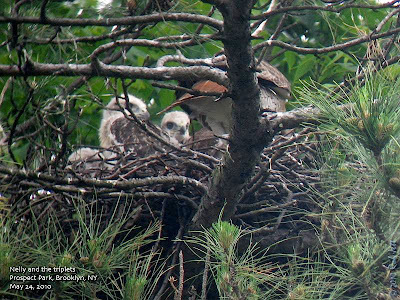 The three young hawks in the pine tree nest have grown amazing fast. When Nelly flew into the nest to check up on them, they seemed to be nearly as tall as their mother. In another week they will be clambering about on the branches around the nest. By the second week of June, they should be taking their maiden flight. Here is Nelly, checking in on her offspring. She only stayed for a couple of minutes, then rejoined her mate at the tuliptree. This video was shot yesterday afternoon. 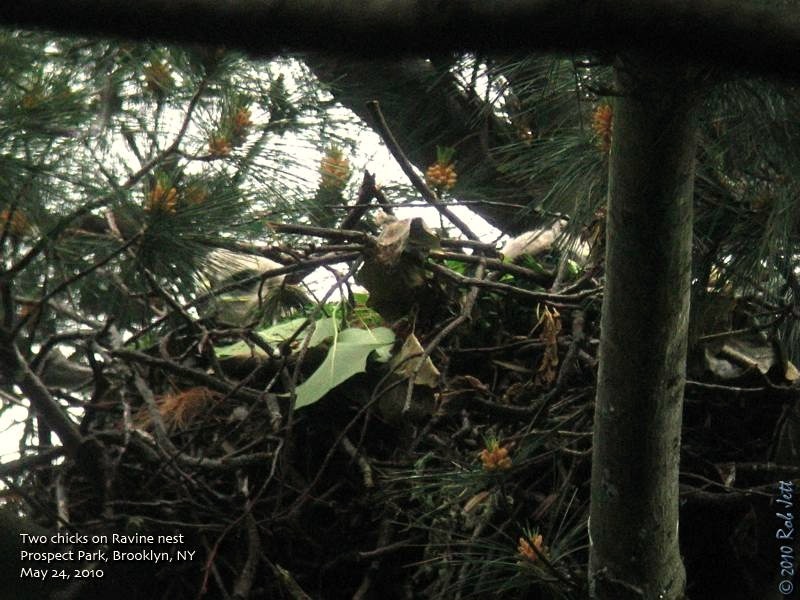 At my new viewing spot in the Ravine I was able to see a second chick in Alice & Ralph's nest. They are much younger than their neighbors in the northern end of the park. On a couple of occasions, I thought I saw another pair of wings flopping around at the far end of the nest, so it is possible that there are three. I watched the nest for 45 minutes, hoping to see one of the parents return to the nest. A dark shadow circled the woods a few times, drawing the attention of the small, fluffy chicks, but neither parent landed on the nest while I was present. Meet 10am at the refuge visitor center then drive ( car pool) to the North Channel Bridge to view the horseshoe crabs and shorebirds. Leaders: Andrew Baksh, Don Riepe. Bring lunch, binoculars. Greetings. This is the New York Rare Bird Alert for Friday, May 21st 2010 at 9pm. The highlights of today's tape are WILSON'S PLOVER, WHITE-FACED IBIS, WILSON'S PHALAROPE, SUMMER TANAGER, BLUE GROSBEAK and lots of migrants. A female type WILSON'S PLOVER found at Jones Beach West End on May 8th but not seen during the intervening week was relocated late Saturday afternoon again in the swale between the concession building and the ocean at the west end parking lot #2. The swale was much drier than the previous week but the plover did come in at high tide along with other shorebirds mostly Semipalmated Plovers. There again have been no reports during the week. A VIRGINIA RAIL was calling just west of the swale Saturday evening. At Jamaica Bay Wildlife Refuge what was presumably the same WHITE-FACED IBIS was seen last Saturday morning at about 8:30a and then reappeared again at 9:15a in the northeast corner of the West Pond. The ibis was seen again on Sunday morning and again today with sightings both at the northeast corner and in the south marsh near bench #1. Also today a WILSON'S PHALAROPE appeared at the north end of the West Pond and a SUMMER TANAGER was also seen near bench #12. As a note, the "Sooty" FOX SPARROW was last seen in Central Park last Friday. A migratory movement last Friday night that was interrupted by a wind shift to the northwest still dropped a good number of migrants into the city parks for Saturday as well as producing an interesting reorientation flight along the ocean coast as birds struggled in off the water while fighting the contrary winds. Thousands of migrants were moving west along the barrier beaches presumably glad to have made it ashore. A count Saturday morning at Robert Moses State Park among 20 species of warblers tallied 110 MAGNOLIA WARBLERS, 70 BLACK-THROATED BLUE WARBLERS and 33 CANADA WARBLERS among the identifiable birds. Also seen were 5 SOLITARY SANDPIPERS, BLACK-BILLED CUCKOO, ALDER FLYCATCHER, PURPLE MARTIN and 9 CLIFF SWALLOWS. A RED-HEADED WOODPECKER also ended up at Jones Beach West End. Some of this flight was also noted in Prospect Park, sightings including 9 SOLITARY SANDPIPERS, OLIVE-SIDED FLYCATCHER and CLIFF SWALLOW. Overall highlights from Prospect Park last weekend featured 2 OLIVE-SIDED FLYCATCHERS, ACADIAN FLYCATCHER and YELLOW-BELLIED FLYCATCHER on Sunday ... and at least 22 species of warblers with TENNESSEE WARBLER, CAPE MAY WARBLER, and 3 MOURNING WARBLERS on Sunday. Forest Park too over the weekend featured 2 plus YELLOW-BELLIED FLYCATCHERS, ACADIAN FLYCATCHER, SUMMER TANAGER at the waterhole and an immature male BLUE GROSBEAK nearby on Saturday and over 20 species of warblers including multiple MOURNING WARBLERS both days and a YELLOW-BREASTED CHAT Saturday. Another SUMMER TANAGER and GRAY-CHEEKED THRUSH and a good variety of warblers were found at the New York Botanical Garden in the Bronx on Saturday. Central Park also produced SUMMER TANAGER Thursday at Strawberry Fields and warblers reported during the week included KENTUCKY WARBLER Monday and MOURNING WARBLER on several days and other birds included OLIVE-SIDED FLYCATCHER Saturday, an uncommon species noted in most other parks too such as GRAY-CHEEKED THRUSH and LINCOLN'S SPARROW. A most unexpected sparrow was found Sunday at Calvert Vaux Park in Brooklyn this a CLAY-COLORED SPARROW that was also joined there by a male BLUE GROSBEAK and 7 BOBOLINKS. Among other sites noting MOURNING WARBLERS included Riverside Park in northern Manhattan on Monday and Quogue Wildlife Refuge last Saturday this species is actually a regular later migration species but its tendency to stay under cover makes knowing its song and distinctive chip note quite useful. A seawatch Wednesday off Robert Moses State Park produced an adult PARASITIC JAEGER as well as a few ROSEATE TERNS and a BLUE GROSBEAK was still around the Moses parking field 2. Out east birds having arrived by last Saturday included CHUCK-WILL'S-WIDOW and WHIP-POOR-WILL, ROSEATE TERNS and GRASSHOPPER SPARROW. On Sunday at Camp Hero in Montauk a young male BLUE GROSBEAK was present and a BLACK VULTURE joined 9 TURKEY VULTURES and 9 BROAD-WINGED HAWKS as they soared over Montauk. 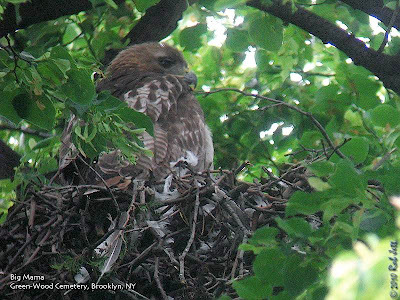 This week I surveyed the three known Brooklyn Red-tailed Hawk nests to see how the hatchlings were progressing. The easiest nest for viewing is the pine tree at the edge of Nelly's Lawn. For a second year in a row, the parents are raising three offspring. When I visited the nest yesterday afternoon, Nelly was busy feeding her brood. They all seem healthy and have started to grow adult body feathers. Their wing feathers are also growing in rapidly. Notice in this video how one youngster is already attempting to flap-hop to the opposite side of the nest. I found a new and fairly decent viewing spot for Alice and Ralph's Ravine nest. Over two days I monitored their nest for an hour each time and was only able to confirm a single hatchling. Although, the nest is very deep and the viewing angle quite steep, so there could be another chick. The chick that I watched is well behind the ones at Nelly's Lawn and likely most of the city's Red-tailed Hawk chicks. It is still mostly covered with down with maybe an inch of adult feathers seen emerging from its tail and wings. I've gotten a little behind on my postings. Well, it is the height of Spring migration, so can you blame me if I end up burning the candle at both ends? We had a marathon weekend of birding in Prospect Park. Beginning at 6am on Saturday, Michael Brams, Paige Linden, Heydi Lopes and I spent most of the day in the park. On Sunday, minus Michael, we spent about 11 hours scouring the park. It was, without question, the most birdy two days Prospect Park has experienced this Spring. Our total for the two days was 93 species, which included 22 species of warbler. North winds finally shifted to the south overnight on Friday. Coupled with milder temperatures, it made for an excellent flight night for northbound migrants. But by early Saturday, the winds began coming in from the north-northwest and had picked up in intensity. Our strategy was to start our day at first light at the north end of Prospect Park. We would head to the Vale of Cashmere, which is in a natural depression, out of the wind and surrounded by trees. When Heydi and I arrived at the "Vale" the sun was just beginning to strike the tops of the trees on the eastern slope. Birds were beginning to move and there was song everywhere.
. A Common Yellowthroat making its "chit" call foraged within a short stand of phragmites that have taken hold inside the ponds. The high-pitched songs of both Blackburnian Warbler and Bay-breasted Warbler rang out from a pair of Black Cherry trees across the water from us. As the early morning progressed and the sun warmed more of the trees that ring the Vale of Cashmere, we found an increasing variety of songbirds alternating between a feeding frenzy and the most intense avian concert of the year. The "Vale" is just a tiny part of Prospect Park's over 500 acres, yet after only about 90 minutes we walked away having seen 18 species of warbler: Tennessee Warbler, Nashville Warbler, Northern Parula, Chestnut-sided Warbler, Magnolia Warbler, Black-throated Blue Warbler, Yellow-rumped Warbler, Black-throated Green Warbler, Blackburnian Warbler, Bay-breasted Warbler, Blackpoll Warbler, Black-and-white Warbler, American Redstart, Ovenbird, Northern Waterthrush, Common Yellowthroat, Wilson's Warbler and Canada Warbler. The day was still young. With the wind blowing across the park from the northwest, I decided it would be best to just stick to the leeward side of the hills and ridges. After leaving the Vale, we visited my favorite puddle - a muddy section of the bridle path between Rick's Place and Payne Hill. I think one of the reasons that birds like to drink and bathe in this spot is that there is a lot of vegetation on either side of the path, plus low hanging branches above. This provides the birds with a safe spot to escape to or preen in after a dip in the water. I've also found that if I drag a large branch over the the puddle's edge, birds immediately use it as a perch to check the safety of the water before descending to it's edge. < /embed>. Our route continued from the Midwood along the Lullwater, then up to the south slope of Lookout Hill. I had to leave by midday, but Michael, Paige and Heydi continued birding for a few more hours. I received a text message later that day. The trio ended up back at the Vale of Cashmere where they found a Mourning Warbler. These skulking ground feeders are not so much rare as rarely seen. It's always a treat to find one of these beautiful birds. We encountered so many birds on Saturday's route that we decided to repeat it on Sunday. It was overcast in the morning, but at 6am in the Vale of Cashmere, there was still a very good showing of birds. The highlight there was finding the Mourning Warbler from the previous day. We would go on to find two more before the day was over. The second was found a few hours later in the Lullwater. We had stopped at a small, wooden overlook above a cove when I thought I heard a very brief segment of the mourning's song. Scanning the underbrush, we eventually spotted the bird when it hopped up into the lower branches of a viburnum shrub. The third individual was seen at around 2:30pm when it flew across the path in front of Heydi and I. We were several yards north of Rick's Place. We also had a very good sparrow list for Sunday, adding towhee, savannah and white-crowned to the previous day's tally. While we still may have a couple of weeks of migration left, I don't think that we'll see the abundance and diversity of species that we experienced over the past weekend. Sunday, May 23, 8 a.m. The shifting dunes, classic saltmarsh and extensive mudflats at Plum Beach are dynamic, ever-changing maritime habitats for myriad seashore species. During May, hundreds of native beach plums are in full blossom and put forth a spectacular display of pink and white. Explore this fascinating area with naturalist Mickey Maxwell Cohen. Binoculars, insect protection and a magnifying glass will be helpful. Meet at 9 AM at the Plum Beach Round House. Enter in the Moshula gate and meet at the Reflecting Pool near the Visitor Center. The NY Botanical Garden was founded in 1891 and now a National Historic Landmark; it is distinguished by the beauty of its diverse landscape and extensive collections and gardens. It is also home to the largest remaining tract of East Coast old-growth forest in NYC. The beautiful gardens and their great diversity of ecosystems attract many species of birds. We will visit during the peak of Spring migration season, when the forests and gardens come alive with songbirds returning from their wintering grounds. Additionally, a NYBG docent will give the group an exclusive tour of the impressive forest. Limited to 15. Saturday May 22, 9 a.m. to 11 a.m.
Past and present blend in the Conference House park where history stretches back thousands of years with the seasonal occupation of the Lenape and hundreds of years with the habitation of the Dutch and English. In addition to the local history we’ll observe the geology of the area and look for what the debris at the high tide line has to reveal. As the tide goes out we'll move into the intertidal zone to find out what sorts of living things survive in this challenging environment. Meet at the parking lot at the end of Hylan Blvd. on the left. Saturday, May 22, 9:45 a.m. to 3:30 p.m.
Spring Ten Mile Walk of the Greenbelt to Save Pouch Camp! This is our annual spring Greenbelt walk, but with an emphasis on our efforts to secure preservation for Pouch Camp. Join us for a rally at the kickoff at 10 a.m. Those not joining the walk may choose to meet up with us at noon for lunch at Berlin Lodge overlooking beautiful Orbach Lake in Pouch Camp. We ask that you bring your own lunch and beverage. Speakers will be on-hand to talk about how vital it is to preserve all of Pouch Camp. The Protectors walk then continues at 1 p.m. Our walk covers ten miles at a comfortable pace. See wonderful vistas, beautiful woodlands and the blooming of the Pinxter Azalea, Highbush Blueberry and Canada Mayflower throughout our Greenbelt. Meet at our new meeting place where the parking is easier: the beginning of the Blue Line Trail, at the end of Staten Island Blvd. (at the end of the road right above Petrides School which intersects Ocean Terrace). Bring lunch, beverage and sturdy walking shoes as well as camera, binoculars and field guides. We go in all weather but walk is shortened if high pollution levels occur. For more information call Dominick Durso at (718) 967-0379 or Chuck Perry at (718) 667-1393. Saturday, May 22, 1 p.m. to 4:30 p.m.
Find out why Protectors urged the preservation of this parkland and how we got our name in 1975. It has two rare pine species, two rare southern oak species, fence swift lizards, and a few rather unusual wildflowers, nothing like our Greenbelt forest. It’s one of the few parks on S.I. that has American chestnut trees, one unhealthy, tall and 8-10 inches in diameter and just recently found, and a second, though younger large tree. The third is a spindly, sick, multi-trunk diseased tree with the chestnut blight but which always seems to flower and set fruit. This is the only park known to have many deer with footprints galore and nibbled native wildflowers and shrubs. Wear waterproof footwear. We have a permit to enter the restricted natural area with Clay Pit Pond on the other side of Clay Pit Road. Meet at the park office at the end of Carlin Avenue, off Sharrott’s Road in Rossville. Registration is required. Contact Sandra Mechanic at (718) 967-1037. Explore each blossom along the trail at the Salt Marsh Nature Center. You supply the curiosity and we'll supply the nets! Dave Burg of “Wild Metro” will speak about birds and their habitat and Habitat Management. All members and guests are welcome to attend this free event. Greetings. This is the New York Rare Bird Alert for Friday, May 14th, at 9:00 pm. The highlights of today's tape are WILSON'S PLOVER, WHITE-FACED IBIS, "SOOTY" FOX SPARROW, LITTLE GULL, and many Spring migrants. 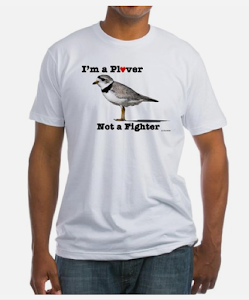 Last Saturday a female type WILSON'S PLOVER was found on the bar off the Jones Beach West End Coast Guard Station and then, after it flew, skillfully relocated by the discoverer in the rather flooded swale in front of the West End 2 concession building. Despite the horrendous winds, a number of birders enjoyed the bird before nightfall, but it could not be relocated on subsequent days. Unfortunately not making last week's tape was the Jamaica Bay Wildlife Refuge WHITE-FACED IBIS, spotted last Friday at the north end of the West Pond, but fortunately it was seen again Thursday morning in the marsh south of the West Pond, where it had also previously occurred in late April. Perhaps the most interesting of this week's rarities is a FOX SPARROW found Thursday at Strawberry Fields in Central Park. Appearing to be a "Sooty" form of Fox Sparrow, which may be elevated to full species status in the near future, the sparrow was still present today, and spends its time foraging in leaf litter under bushes on the eastern downslope of Strawberry Fields, located a short distance straight into the park from the West 72nd Street entrance off Central Park West. This bird is definitely worth seeing. Otherwise it was a great week for seasonal migrants, common and uncommon, especially today as the incoming front brought with it a wide variety of birds in decent numbers. In Central Park, as our local migration barometer, today produced good numbers of warblers including several TENNESSEE WARBLERS, BAY-BREASTED WARBLERS, and CAPE MAY WARBLERS along with a couple of MOURNING WARBLERS, plus WORM-EATING WARBLER, HOODED WARBLER, and YELLOW-BREASTED CHAT. A singing PHILADELPHIA VIREO and a male SUMMER TANAGER added to the excitement, and also present were GRAY-CHEEKED THRUSH and LINCOLN'S SPARROW. Many birds were seen around a termite hatch-out, an often very productive phenomenon. A KENTUCKY WARBLER was in the Ramble Thursday, and another at the north end last Saturday. An OLIVE-SIDED FLYCATCHER and YELLOW-BELLIED FLYCATCHER were among the flycatchers seen this week, with a male BLUE GROSBEAK in the Ramble Tuesday. Four CLIFF SWALLOWS were seen over the Lake early in the week. Prospect Park also had a good week, with a BICKNELL'S THRUSH identified Tuesday, and birds today included BALD EAGLE, OLIVE-SIDED FLYCATCHER and MOURNING WARBLER. Riverside Park in northern Manhattan has entertained an immature male BLUE GROSBEAK Thursday and today, and also featured YELLOW-BILLED CUCKOO Friday and TENNESSEE WARBLER Thursday. In Forest Park an ORANGE-CROWNED WARBLER was still around the water hole yesterday, the park also hosting OLIVE-SIDED FLYCATCHER and YELLOW-BILLED CUCKOO last Saturday and lots of warblers since. A female SUMMER TANAGER was in Alley Pond Park Monday, preceded by a male in Tobay Sanctuary's Pine Grove Sunday and followed by one at Jamaica Bay Wildlife Refuge near Big John's Pond on Thursday. A KENTUCKY WARBLER was found at Valley Stream State Park on Monday. Alley Pond Park also featured KENTUCKY and MOURNING WARBLERS last Saturday, the MOURNING lingering to Sunday. A BLUE GROSBEAK has stayed in the vicinity of the entrance booth at Robert Moses State Park field 2 from Wednesday through today. BLUE GROSBEAK was also noted at Hoyt Farm Park in Commack Thursday, and reports from the Quogue Wildlife Refuge mentioned a YELLOW-THROATED WARBLER Thursday and MOURNING WARBLER Friday. An immature LITTLE GULL, a GLAUCOUS GULL, three GULL-BILLED TERNS and five BLACK TERNS were among the birds reported Thursday at Breezy Point where a JAEGER had been noted Monday along with three ROSEATE TERNS, and two LESSER BLACK-BACKED GULLS were seen Wednesday. Other ROSEATE TERNS have been scattered along the coast recently, and two BLACK SKIMMERS were at Riis Park Thursday. An ICELAND GULL appeared Saturday at Jones Beach West End and then at field 10 Jones Beach, and two LESSER BLACK-BACKED GULLS were in the Jones Beach West End swale on Wednesday where two GULL-BILLED TERNS visited Saturday. Ten WHITE-RUMPED SANDPIPERS were among the good collection of seasonal shorebirds at Jones Beach West End Tuesday. The Eastern Kingbird is a migrant flycatcher. They are just beginning their breeding cycle within our city parks. Watch for these very vocal, aggressive and fearless "tyrants" as they chase birds even as large as Red-tailed Hawks. For millennia, migrant birds such as the nightingale, the turtledove, the swallow and the cuckoo have annually flown out of Africa to bring the spring to Europe, and in so doing, become a key part of Western culture. Now many of these birds are crashing in numbers, in what threatens to be not just a wildlife tragedy, but a cultural one. Sunday, May 16, 8 a.m.
Meet 9:20 am at the Brooklyn Botanic Garden Eastern Parkway entrance. Note: This walk celebrates the Garden's centennial. There is an admission fee unless you are a BBG member. Note: This walk brings together members who will assume leadership as a group. Meet 9am at parking lot in Plum Beach to look for mating horseshoe crabs and shorebirds. Leaders: Andrew Baksh, Don Riepe. Call (718) 318-9344; E-mail: driepe@nyc.rr.com. Saturday, May 15, 10:00 a.m. to 2:00 p.m.
For our 167th monthly Forest Restoration workshop, meet at the Administration Building at High Rock Park (follow the road into the park from the top of Nevada Avenue) to join with other volunteers taking part in It's My Park Day. New York City parks depend heavily on volunteers to keep their many acres planted and clean. As the “Borough of Parks” we have more to take care of than the others, and are proud of it! If you don't have your own, NYC Dept. of Parks and Recreation will provide gloves and equipment. NYC Parks would like you to RSVP to (718) 667-2165, but come along even if you don't call before. For more information call Don Recklies at (718) 768-9036. The tidal wetlands near the northwest corner of Staten Island are a refuge for a collection of nocturnal birds that migrate through and nest on Staten Island. The rails and herons, bitterns and moorhens of River Road squawk, cackle and coo through the night. A quiet walk along River Road will offer a chance to discern the sounds of the wetlands. Join Cliff Hagen as he alerts participants to the songs and calls of the moonlit marsh. The group will meet at the corner of Chelsea Road and River Road. Bring the entire family and enjoy a magical afternoon learning more about our feathered friends. Learn the finer points of prunning and tools of the trade. Climb the Peaks of Central Park! 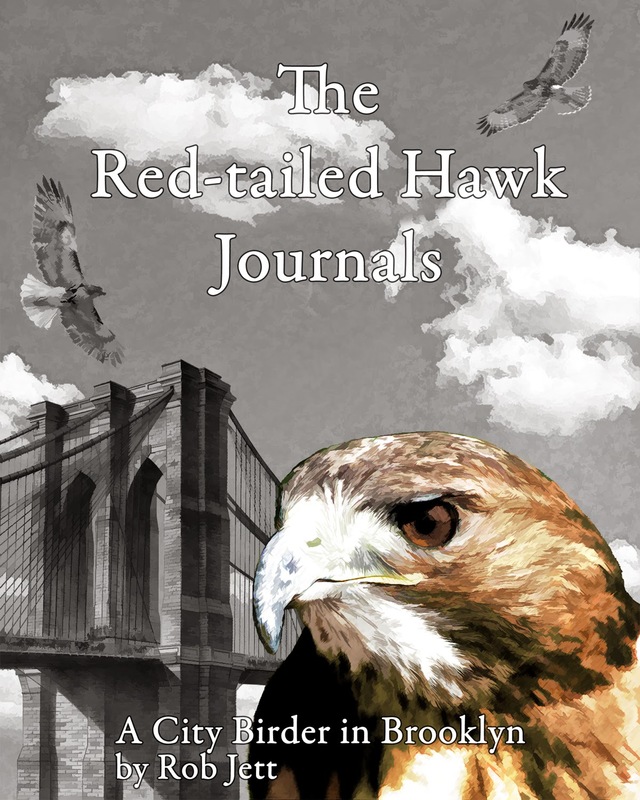 Athena, a red-tailed hawk that reigned atop the towers of the Robert F. Kennedy Bridge, has died, apparently from dining on a poisoned rat snatched from below. Chief among the mourners was Jeffrey Kollbrunner, one of the city’s more dedicated trackers of raptors. He’s the sort who stops traffic on Queens Boulevard to retrieve a bewildered fledgling whose flying lesson suddenly turned pedestrian. 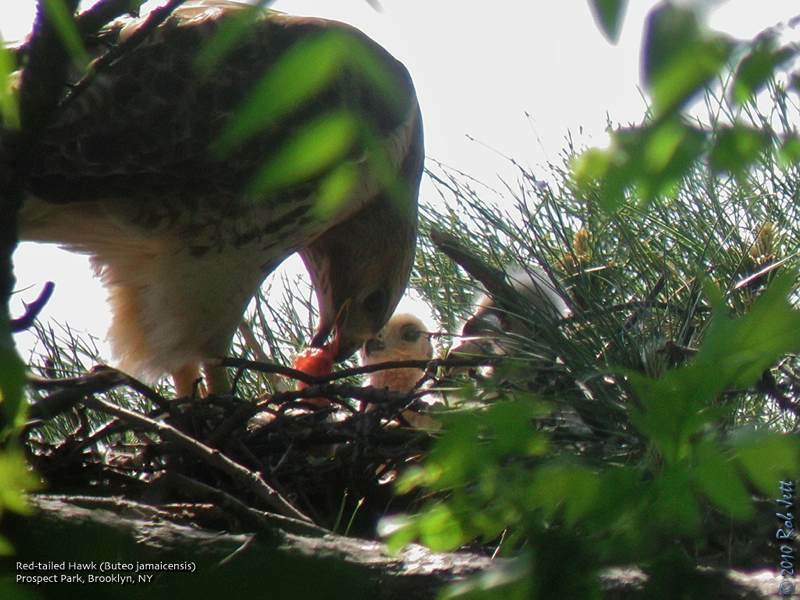 In the current red-tail nesting season, Mr. Kollbrunner is tracking 25 pairs in Queens County as an urban naturalist and consultant for the Audubon Society. “The first-born baby scared me the other day, teetering unattended at the edge of the nest,” he says. He watched it all on the Hawk-cam, a 24/7 Web camera he has pointed on the nest of Momma and Poppa, red tails he has monitored like family for 12 years. Momma returned in time with tasty prey, sparing junior a 90-foot flop to the sidewalk. Succulent pigeons can outrace red hawks in a straight line, so Momma and Poppa developed an ambush strategy. He sneaks up to roust rooftop flocks toward Momma as she flies out of the sun for a kill. 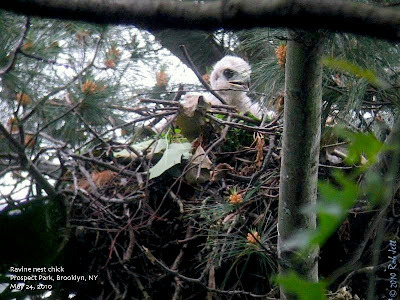 Mr. Kollbrunner, born in Queens, found his first hawk sighting so exotic that he became a wildlife photographer and a teacher of ways to track life along the skyline. 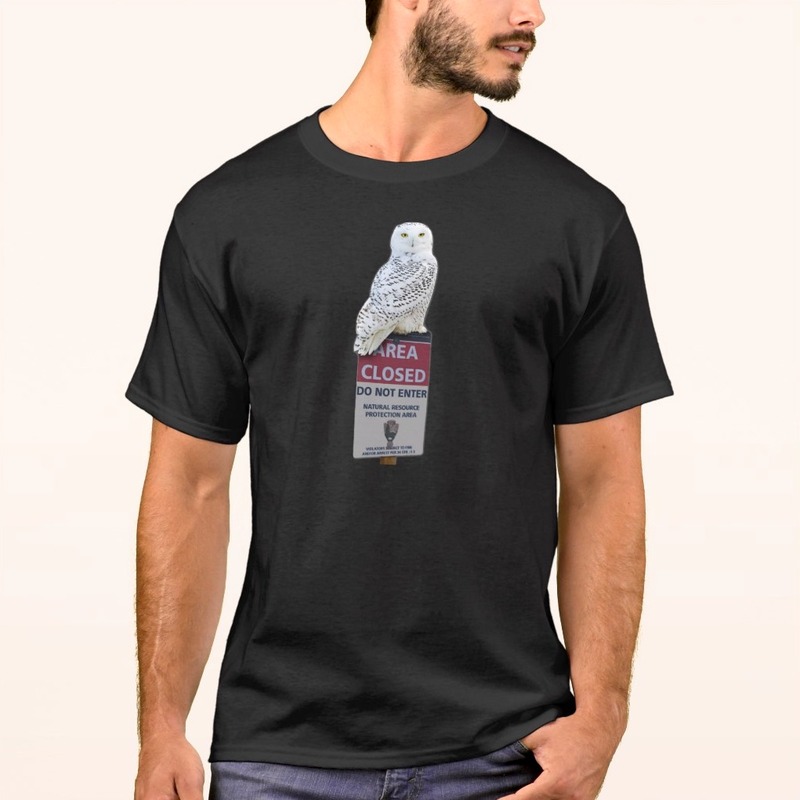 For him, romance teems in the airy jungle of kestrels, peregrine falcons, coopers and sharp-shinned hawks, plus his red tails. Greetings. This is the New York Rare Bird Alert for Friday, May 7th, at 7:00 pm. Before commencing the tape, it is with great sorrow that we mention the sudden passing of Matt Bayer, an energetic birder and superb naturalist. Matt will be greatly missed by all of us who roam Long Island, and our deepest condolences go out to Matt's family. The highlights of today's tape are WHITE-WINGED DOVE, SANDHILL CRANE, MANX SHEARWATER, PROTHONOTARY WARBLER, YELLOW-THROATED WARBLER, SUMMER TANAGER, BLUE GROSBEAK, and many Spring migrants. On Sunday morning a WHITE-WINGED DOVE was spotted sitting in with rock pigeons near the rest rooms by the Coast Guard Station at Jones Beach West End. Once it flew off, the dove could not be relocated. Also at West End, up to four GULL-BILLED TERNS have been present, often on the bar off the Coast Guard Station. An increasing variety of shorebirds there recently included many RED KNOTS and SHORT-BILLED DOWITCHERS, and COMMON TERNS and LEAST TERNS are also showing up. A LESSER BLACK-BACKED GULL was noted at West End field 2 Monday. On Monday morning an adult SANDHILL CRANE visited the field at Marshlands Conservancy in Rye, and an immature male BLUE GROSBEAK appeared there this morning. A pair of BOAT-TAILED GRACKLES has also been frequenting the marsh at Marshlands recently. The city parks have recently enjoyed a good diversity of migrants, though the early leaf out of the trees has not helped visibility. Almost all the warblers have appeared, some seemingly early, like BLACKPOLL WARBLER and CANADA WARBLER last Saturday, and BAY-BREASTED WARBLER, CAPE MAY WARBLER and WILSON'S WARBLER quickly thereafter. Decent numbers have been noted of many species, but they do seem to be moving through quickly with the weather pattern. Among the rarer warblers, a YELLOW-THROATED WARBLER was spotted yesterday morning at the north end of Central Park near the Pool, between 101st and 103rd Streets. Previously unreported PROTHONOTARY WARBLERS were found at Clove Lakes Park on Staten Island last Saturday, and noted briefly in Prospect Park Tuesday by a birder hustling in to see the WHIP-POOR-WILL near Boulder Bridge. Another WHIP-POOR-WILL was reported from the north end of Central Park on Monday. Also in Central Park, a KENTUCKY WARBLER appeared near Tanner's Spring on Monday, with another KENTUCKY today, along with a singing MOURNING WARBLER in Alley Pond Park. 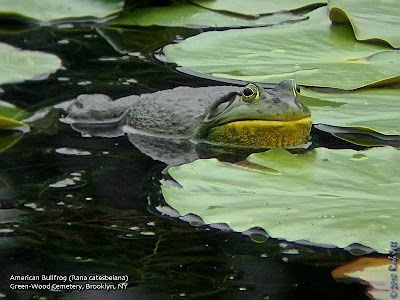 Other species noted in Central and Prospect Parks have included one or two TENNESSEE WARBLERS, some BLACKBURNIAN WARBLERS, a CERULEAN WARBLER at Cherry Hill in Central Park Sunday, WORM-EATING WARBLER, a lingering LOUISIANA WATERTHRUSH or two, and HOODED WARBLER. YELLOW-BREASTED CHAT was also reported from Central Park Sunday, but most unusual this spring has been the number of ORANGE-CROWNED WARBLERS. 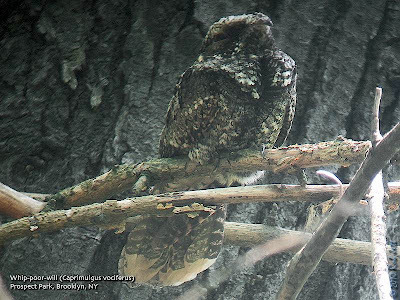 Two were seen in the same tree last Saturday in Prospect Park, and in Forest Park one began singing last Saturday in shrubbery at the water hole and continued there at least to Tuesday. Clove Lakes Park also produced CERULEAN and HOODED WARBLERS Saturday, and as an indication that parts of the migration at least are bypassing the City, last Sunday, May 2nd, warblers on territory at Sterling Forest State Park in Orange County included good numbers of GOLDEN-WINGED WARBLERS, CERULEAN WARBLERS, HOODED WARBLERS and other breeders. SUMMER TANAGER reports from Sunday included Central and Prospect Park as well as Riverside Park in northern Manhattan, and good numbers of SCARLET TANAGERS, BALTIMORE ORIOLES, ORCHARD ORIOLES, ROSE-BREASTED GROSBEAKS, and INDIGO BUNTINGS have arrived this week. 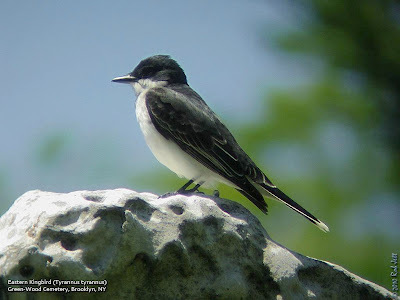 Also being seen are some YELLOW-BILLED CUCKOOS, EASTERN WOOD-PEWEE, LEAST FLYCATCHER, five species of Vireos, PURPLE MARTIN, CLIFF SWALLOW, BANK SWALLOW, SWAINSON'S THRUSH, GRAY-CHEEKED THRUSH (the latter as of today in Central Park), and LINCOLN'S SPARROW. One or two adult RED-HEADED WOODPECKERS have also been spotted during the week in Central Park. Shorebirds have included an UPLAND SANDPIPER at Calvert Vaux Park last Saturday and WHITE-RUMPED SANDPIPER at Plumb Beach Thursday (these both in Brooklyn), and LEAST SANDPIPER and SEMIPALMATED SANDPIPER at Jamaica Bay Wildlife Refuge last Saturday. Another RED-HEADED WOODPECKER was seen flying west at Robert Moses State Park Sunday during an interesting sustained westbound movement of migrants there. Out East, a MANX SHEARWATER and three WHIMBREL were seen Sunday off Montauk Point, with three RAZORBILLS and an ICELAND GULL there Saturday, and three HARLEQUIN DUCKS at Turtle Cove both days. Napeague Sunday produced a BALD EAGLE and a NELSON'S SPARROW, while on Saturday an immature male BLUE GROSBEAK was found at Camp Hero in Montauk. I had time this afternoon to check on the Brooklyn hawk nests, plus one reported new nest site. Big Mama and Junior, the Green-Wood Cemetery pair, appear to have hatchlings, although it's difficult to tell how many. Marge and I watched Big Mama feeding at least one chick. The nest it extremely high up in a linden tree, so until the chick(s) get a bit bigger, they are very difficult to see. At one point, it did appear that Big Mama was alternating between two points within the nest, so it's possible that there are two hatchlings. 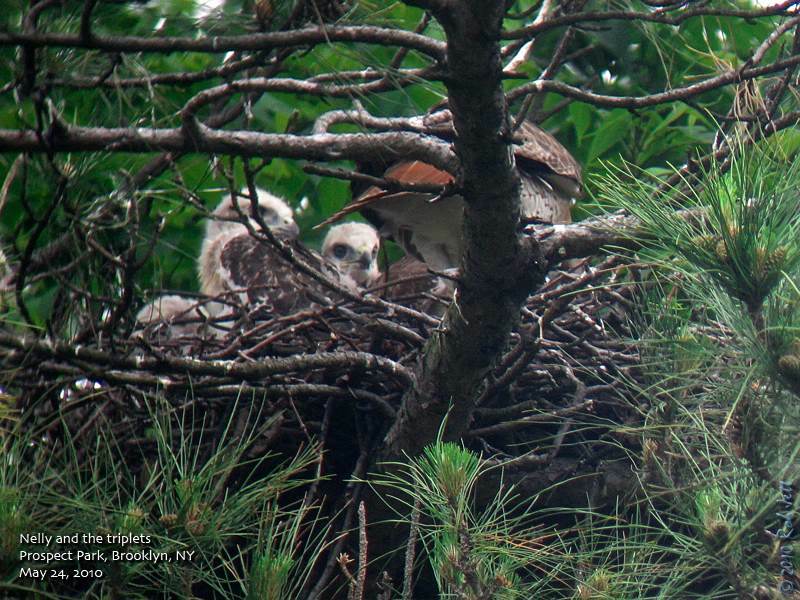 Nelly and Max, the Prospect Park pair in the pine tree at Nelly's Lawn, have three young. They appear to be between 1 and 2 weeks hatched. This is their second year with triplets. 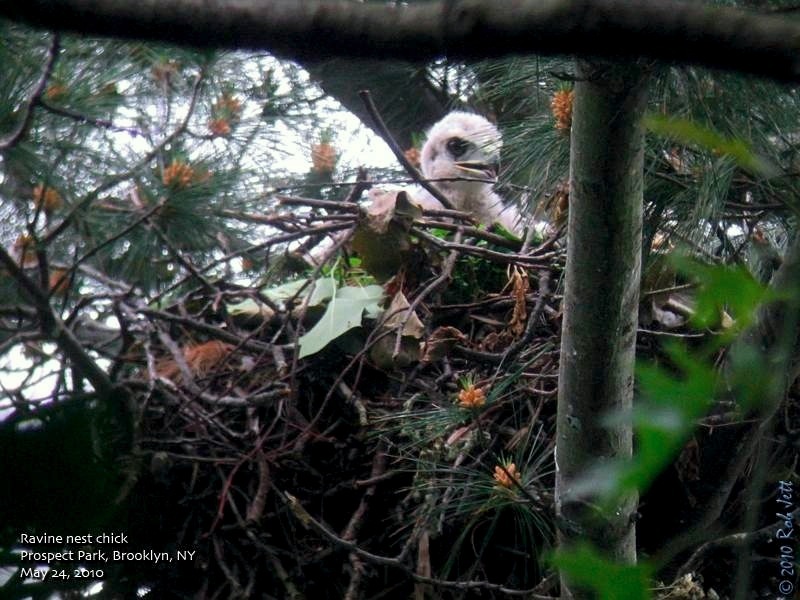 Ralph and Alice, the Prospect Park Ravine pair have become impossible to view in their pine tree nest. I've seen them flying into and out of the nest, so I presume there are hatchlings, but the surrounding trees completely block the view. I'll wait a few weeks when any young might be climbing around and report back. Marge and I also went to McCarren Park in Williamsburg to look for the reported nesting hawks. There were definite signs that nests were attempted in the lighting structures above both the baseball fields and across the road at the outdoor track. The track's lighting seemed a bit more substantial, but neither were complete enough for raising young. We spoke with a young couple who saw us checking out the incomplete nest on the baseball field. They said that they see "the falcon" around the park fairly regularly, but also suggested we check closer to the water. There are several large oak trees around the park, but nothing big enough to support a Red-tailed Hawk nest (or to overlook one, if they did build it). There are also several incomplete condos around the area that could have been selected as a nest site. I'll keep you posted. It was the end of the day and we had about an hour of light left to find some more birds. Paige and I were standing on the rustic, wooden bridge that spans the stream, scanning for birds coming down to bathe or drink at the water's edge. Earlier we had seen a Blue-winged Warbler nervously approaching the water. Nearby were robins and Yellow-rumped Warblers. At one point, a Black-and-white Warbler, White-throated Sparrow and Black-throated Blue Warbler lined up side-by-side, dipping into the water then shaking off their plumes. We returned to the bridge after looping around through the Ravine, Rick's Place and the Vale of Cashmere. There were less birds this time, but another animal was probing under the stream's boulders and rocks. The young raccoon seemed oblivious to our presence and continued foraging for food. He found an acorn and carefully removed the shell before eating it. Several couples with children passed by and we pointed out the hungry mammal. Like an idyllic scene from a rural town somewhere in Upstate New York, this cropped image was narrow and deceptive. Prospect Park's 526 acres of maintained nature is a mere postage stamp within an urban setting of concrete, asphalt and throngs of humans. This individual raccoon will likely live out its entire life unaware of the complex gauntlet of barriers just a few hundred yards from his patch of forest. Eagle-eyed Matthew Wills spotted this Whip-poor-will sleeping in a tree in Prospect Park. Donna, Heydi, Joe, Matt, Paige and myself got into the park before sunset and watched the bird until it woke up, preened, then flew off for a night of catching insects. A few more images are here. During the month of April I added 37 more species to my year, bringing the total to 162. 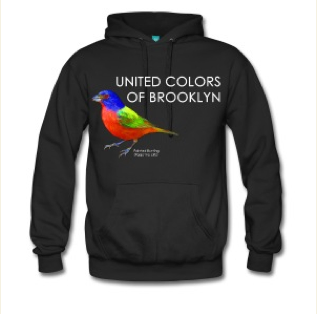 All were found in the borough of Brooklyn. As one would expect, April started off slowly. Within the first week, there were clear signs of the songbird migration, but I only managed to add 7 new species. Through the middle of the month, myself and other birders were beginning to become concerned as there hadn't been any real big northbound push. Through the second and third week of the month, there were no surprises and I extended my list by only 13 species. A singing Bobolink in Prospect Park was a great addition as these increasingly rare birds are seldom found in my local park. The month ended with a change of temperature and a nice south wind. I was fortunate enough to get into Prospect Park early that morning and experienced a phenomenal fallout of birds. Over the course of just a couple of hours I added 16 species of birds; 10 of which were wood-warblers. Sunday, May 9, 8 a.m.
A global event celebrating the beauty of birds and habitats. This event encourages fundraising for conservation causes. For this year, a cause will be discussed and adopted by the Birdathon members, posted on the Prospect Sightings blog. If you are interested in forming a team with members or friends with encouragement for pledges and fundraising, or need more information, please contact the BBC Birdathon coordinator Peter Dorosh at Prosbird@aol.com. 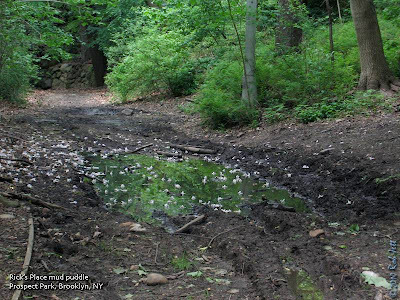 Discover this hidden natural park in Dongan Hills. We’ll visit the three bodies of water in the park and stroll through the woodlands. Although none of Reed’s basket willow still grow near the swamp from which the park gets its name, the woodlands and stream are still home to a wide variety of flora and fauna. Meet at the Spring Street entrance in Dongan Hills. Saturday, May 8, All Day! Gather up a friend or two to go bird watching any where you would like on Staten Island from Midnight to Midnight, and record all species you find! Join other participants at the Round-Up to hear what and where other teams found throughout the day! Meet at the Martling Ave Bridge, near the corner of Slosson and Martling Ave.
Don't miss these tiny, colorful, flying gems that flock to our parks in migration seasons. Explore the smallest salt marsh creatures. Discover the wonderful world of of wildflowers and try to identify what we find. Identify some of Van Cortlandt Park's leafy green giants -- trees! Explore the natural history of Highbridge Park, located in Northern Manhattan. Learn about the Native American tribe that inhabited this area.